Protection schemes often involve the use of logic to determine the conditions under which designated circuit breakers should be tripped. Traditionally, this logic was implemented by means of discrete relays, separate from the relays used for protection. Such implementations would occur where electromechanical or static relay technology is used. However, digital and numerical relays normally include programmable logic as part of the software within the relay, together with associated digital I/O. This facility offers important advantages to the user by saving space and permitting modifications to the protection scheme logic through software if the protection scheme requirements change with time. Why is it important to perform secondary injection testing? The purpose of secondary injection testing is to verify that the correct operation of the protection scheme from the relay input terminals onwards is functioning correctly with the settings specified. Secondary protection system consists of auxiliary relays, protective relays, protection circuits, metering devices, communications and control systems, low-voltage devices etc. 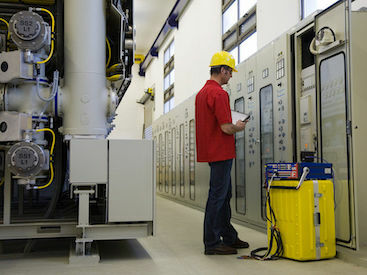 Secondary injection test comprises not only the testing of protective relays and their tripping settings, but also verifying all related circuits and gears included in the correct functioning of the secondary protection system. Secondary injection tests are always done prior to primary injection test. So that threats associated with the initial testing to the low voltage side of the device under test is reduced. The primary or high voltage side of the equipment is disconnected, so that no harm can occur. It is a crucial test that should be carried out on a trip unit in the course of service. By connecting secondary injection test sets we can ensure that the trip unit, associated components and its settings or factory parameters are functioning as they should. Why secondary protection relay verification is important in Solar installs? Secondary protection is the protection after the solar inverter and before the grid. It is comparable to Primary Protection, which is within the inverter. Secondary protection is generally used where the installation is greater than 30kW and often includes Anti-Islanding protection, over/under voltage, over/under current and frequency protection. Under/Over Voltage – Protects against voltage fluctuations that can lead to things such as insulation damage or inefficient performance. Under/Over Current – Protects against current fluctuations by tripping when the current level goes outside of the current limits. Rate of Change of Frequency (ROCOF) – Protects against frequency instability, when the frequency is changing too frequently the main circuit breaker. Neutral Voltage Displacement (NVD) – Disconnects the generator from the system when the grid’s fault current is interrupted. Loss-of-Mains (LoM)/Anti-Islanding – Protects utility workers by disconnectin g the distributed generator from utility lines when the utility grid has been cut off so that the utility lines aren’t still being powered without the workers knowledge. DaRa make complex solar testing simple and fast so you can connect the solar system to the grid fast. The grid-connected solar systems above 30kW must install grid protection relays and requires secondary injection testing to prove that the correct operation of the protection relay as per the parameters set by the DNSP.